AIM: This study aimed to compare the central corneal thickness (CCT) measurements using Optical Coherence Tomography (OCT) and TMS-5 topographer with that taken with the gold standard digital Ultrasonic pachymeter (USP). MATERIALS AND METHODS: A total of 61 subjects (122 eyes) were prospectively and consecutively studied in a period from June 2016 to June 2017 at Sudan Eye Centre (SEC), Khartoum, Sudan. Besides the visual and refractive data, measurements of CCT were taken using OCT, TMS-5 and USP. Data analyzed using SPSS software for windows (IBM SPSS 20, IBM Corp., Armonk, NY). RESULTS: A statistically significant differences in mean CCT was detected between the three instruments (P < 0.001). USP was found to measure the CCT 29μm thicker than OCT and 22μm thicker than TMS-5 topographer. A significant difference was also found between OCT and TMS-5. OCT found to give the lower values of CCT compared to both USP and TMS-5 topographer. Further analysis showed that the three procedures were significantly and strongly correlated to each other (USP vs OCT, r = 0.77), (USP vs TMS-5, r = 0.78) and (OCT vs TMS-5, r = 0.80). CONCLUSION: Mean central corneal thicknesses (CCT) were comparable among OCT, TMS-5 topographer and the gold standard USP. However, there is a reproducible systematic difference between CCT measurements taken with the three devices. It is important to note in clinical practice, that measurements acquired by these three modalities are not directly interchangeable. Surgeries for correction of refractive errors are planned according to the preoperative CCT; however, accurate measurements of CCT are also important in orthokeratology and contact lens practice. The current gold standard for corneal thickness measurement is the applanation ultrasound pachymeter (USP), although some complications that could be caused by the direct contact of the probe to the cornea. Such complications include irritation, epithelial erosion, and spread of infection. Recently, several noncontact pachymetry devices are available such as Pentacam, Orbscan II, optical coherence tomography (OCT), TMS-5 topographer, and confocal and specular microscopes. However, discrepancies in CCT measurements obtain with these different devices are a problem when a patient needs long-term follow-up or the readings from these instruments themselves needed for surgical decision. The variation of results between CCT measures was reported earlier by some researchers.,, The current study aimed to compare and discuss the agreement of CCT measurements made using OCT and TMS-5 topographer with the outcome measure of the gold standard USP. To the best of our knowledge, no study compared the CCT values measured by OCT and TMS-5 topographer. One-hundred and twenty-two eyes from 61 healthy patients seeking laser vision correction and referred from hospitals and optometry clinics from around Khartoum were recruited in this study. Patients who wear different designs of contact lenses were told to stop the lens for at least 2 weeks prior investigations. Patients with any ocular conditions besides refractive errors and those with systemic illness that could interfere with the study were excluded from the study. All eyes were assessed using the Stratus OCT (Carl Zeiss Meditec AG, Germany) and the TMS-5 Scheimpflug and Topographer (Tomey Co., Ltd, Nagoya, Japan). The CCT measurements by two devices were compared with that obtained with digital USP UP-1000 (Nidek Technologies, Gamagori, Japan). All participants gave their informed consent after being told about the purpose of the study. The study was performed at Sudan Eye Center, Khartoum, Sudan, in the period between June 2016 and June 2017. Parameters investigated included demographic profile of patients (age and gender), vision and best-corrected visual acuity (BCVA), refraction, mean keratometric reading, and CCT. Vision assessed using LED chart projector (TCP-1000, Tomey Co., Ltd., Japan). Visual acuity was taken for each eye without optical correction (unaided) and with spectacles' correction (if found). Refractive status of participants was measured using automated autorefractometer (RC-800 Tomey Co., Ltd., Japan). The flattest and steepest keratometric readings were measured during autorefkeratometry using RC-800 autorefkeratometer (Tomey Co., Ltd., Japan). Average of three readings was taken as the correct reading. Mean keratometric reading (Mean K) was then calculated as the average between the flattest and steepest keratometer readings. CCT was evaluated using Stratus OCT (Carl Zeiss Meditec AG, Germany), Tomey TMS-5 Scheimpflug and Topographer (Tomey Co., Ltd., Nagoya, Japan), and digital USP UP-1000 (Nidek Technologies, Gamagori, Japan). The Stratus OCT is a time-domain OCT device used for many applications including examinations of anterior and posterior eye segments. The TMS-5 can enable the calculation of up to 7300 points obtained by the Placido disk and up to 40,960 points obtained by the Scheimpflug camera. Corneal thickness was also measured with a conventional ultrasound biometer/pachymeter, the Nidek UP-1000. To ensure the repeatability of the positioning of the pachymeter in subsequent measurements, a fixation panel was placed in front of the patient so that the tip probe contacted the cornea at the visual center. Before the investigation, all patients underwent a complete ophthalmic examination including ocular and general history, vision, manifest refraction, BCVA, slit-lamp microscopy, keratometry, and indirect ophthalmoscopy. The CCT was first measured using TMS-5 topographer followed by OCT and USP, respectively. Patients were given 2 min break between the measurements. Two minutes before USP measurements, 0.5% tetracaine drop was instilled in both eyes for anesthesia. All measurements were made between 3.00 pm and 6.00 pm. All examinations were done by a single skilled optometrist. The instruments used in this study were subjected to a validation test, where measurements were taken from 12 patients (24 eyes) of Sudan Eye Centre staff on two consecutive mornings. The Pearson's correlation coefficient (r) between the different CCT readings was found to be 0.95, 0.98, and 0.96 for USP, OCT, and TMS-5 topographer, respectively, with a significant level of P < 0.001. On the other hand, the Bland–Altman plot was also used to compare the instrument-to-instrument measurements. 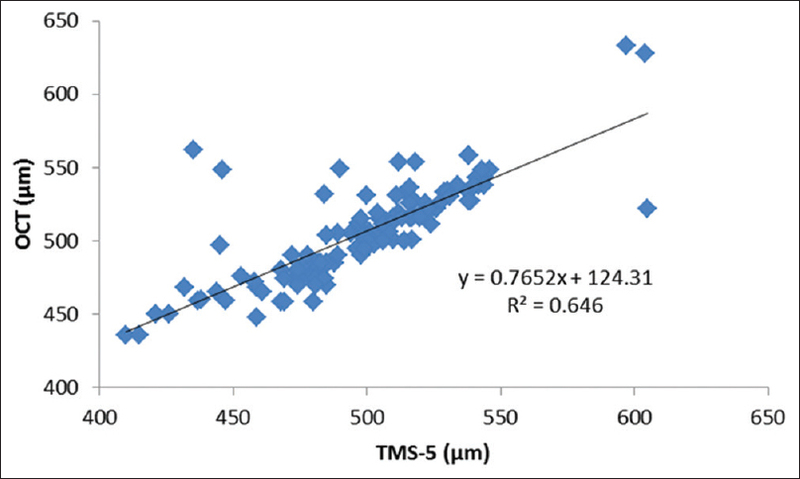 OCT and TMS-5 measures were compared to the gold standard USP, respectively [Figure 1]. Data were analyzed using IBM SPSS 20 (IBM Corp., Armonk, NY, USA). Simple descriptive statistics were used to describe the study parameters. The tests included means, standard deviations, and frequencies. Paired sample t-test and between-group analysis of variance (ANOVA) were used to compare between the means of CCT measured using the three devices. Pearson's correlation coefficient was also used to find the linear relation between the CCT measured using the three devices. P <0.05 was taken as a significant level. A total of 61 patients (122 eyes) were recruited in this study. Mean age of patients was 29 ± 8.7 (range: 16 to 52 years). Females represented 77% of patients. Mean unaided visual acuity (UNVA) was 0.2 ± 0.2 (range: 0.01 to 1.00), while BCVA was 0.9 ± 0.2 (range: 0.20 to 1.2). Mean keratometric reading (Mean K) was 43.5 ± 2.1 (range: 40.04 to 48.86 D). Mean spherical equivalent of refraction (SE) was -3.7 ± 4.2 (range: -17.50 to 7.00 D). Regarding CCT, mean CCT taken by USP was 527.4 ± 39.5 μm (range: 436.0–640.0 μm). Mean CCT taken with OCT was 498.3 ± 34.9 μm (range: 410.0–605.0 μm). Mean CCT taken with TMS-5 topographer was 505.6 ± 33.2 μm (range: 436.0–633.0 μm). Descriptive statistics also showed that mean CCT measured using USP was 29 μm and 22 μm thicker than CCT taken using OCT and TMS-5, respectively. TMS-5 topographer also measured 7 μm CCT thicker than OCT.
Before start this part of analysis, assumptions for each statistical test were checked and found not violated. Between-groups ANOVA was used to compare mean CCT taken by USP, OCT, and TMS-5 topographer. The test yielded significant different in mean CCT taken between these instruments, F2 = 21.5, P < 0.001. Paired sample t-test showed significant difference between CCT taken with USP and OCT, t (121) = 12.7, P < 0.001. The test also showed significant difference between CCT with USP and TMS-5 topographer, t (121) = 9.8, P < 0.001. The test also showed significant different between CCT taken with OCT and TMS-5, t (121) = −3.8, P < 0.001 [Table 1]. 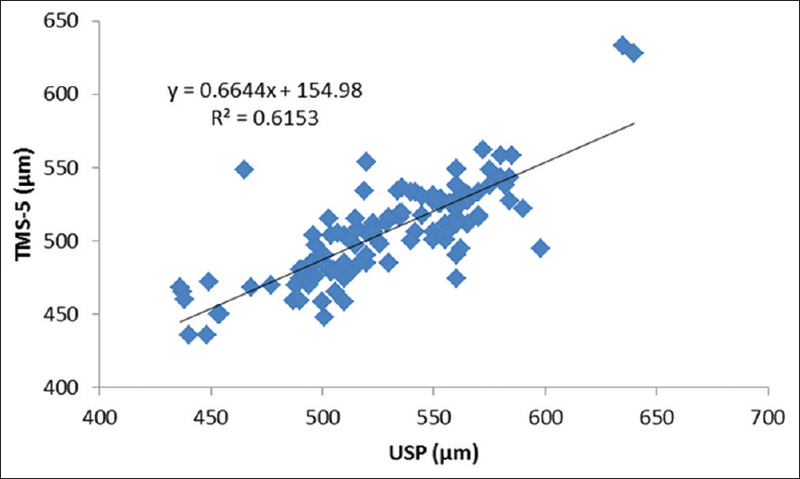 On comparison of USP, OCT, and TMS-5 topographer, measurements showed a strong correlation between USP and OCT, r = 0.77, P < 0.001. Furthermore, strong correlation was found between USP and TMS-5, r = 0.78, P < 0.001. Linear correlation was also found between measurement taken by OCT and TMS-5 topographer, r = 0.80, P < 0.001 [Figure 2], [Figure 3], [Figure 4]. Further analysis also showed significant negative correlations between mean keratometric readings and CCT measured with USP (r = −0.4, P = 0.001), between mean keratometric reading, and CCT measured by OCT (r = −0.3, P = 0.003), while no significant correlation was found between mean kerarometric reading and CCT taken using TMS-5 topographer (r = −0.2, P = 0.08). Several studies in the literature comparing CCT measurements with different new modalities such as Pentacam, Orbscan, and AS-OCT.,,,, In the present study, the gold standard USP, OCT, and TMS-5 topographer were compared, and it was demonstrated that there were significant differences in CCT measured between the three modalities. The current findings showed an overall strong agreement in measuring CCT between the three modalities. However, CCT measurements with OCT showed a good correlation to those obtained by the other two instruments and tended to give statistically significant lower CCT readings, followed by TMS-5 topographer and USP (the highest value) with the mean difference of 7 μm and 29 μm, respectively. These findings agreed that reported by Leung et al. and Scotto et al., who found the overestimation of USP compared to different OCTs. Other studies carried out by Li et al. and Beutelspacher et al. reported no significant differences between USP and OCT in CCT values. The reason behind these differences could be attributed to the higher resolution of OCTs and TMS-5 topographers which provides enhanced images due to higher reflectivity that improves edge detection. In addition, their fast scanning method considerably reduces ocular movement artifacts, and this is definitely could not be controlled well with the gold standard USP. The current study showed that CCT measured with OCT was significantly thinner than that measured using USP with a difference of 29 μm in average. The results showed a significant correlation between OCT and TMS-5 topographer, between USP and OCT, and between USP and TMS-5 topographer with correlation values of 0.80, 0.77, and 0.78, respectively. However, the variations between these instruments emphasize the differences in technological and clinical situations of each method. Gorgun et al. studied the differences in CCT values between Visante OCT, Pentacam, and Orbscan topographer and reported that although the three devices were well correlated to each other and the differences in measures may not be sufficient for interchangeably use in clinical practice. Similarly, Ramesh et al. found significant overestimation in CCT measured using USP compared to OCT. These variations in the current study should be undertaken in ophthalmic practices, especially when planning for laser vision correction and different modalities of refractive surgery. CCT measured by OCT, TMS-5 topographer, and ultrasonic pachymeter were comparable. However, there is a reproducible systematic difference between CCT measurements taken with the three devices. It is important to note in clinical practice, that measurements acquired by these three modalities are not directly interchangeable. We are grateful to the staff of Sudan Eye Centre, Khartoum, Sudan, for their great support during this study. We would also like to thank all patients who participated in this study. Alonso RS, Fontes BM, Ventura MP, Ambrósio Jr R. Repeatability of central corneal thickness measurement with Pentacam HR system. Rev Bras Ofthalmol 2012;71:14-7. Doughty MJ, Zaman ML. Human corneal thickness and its impact on intraocular pressure measures: A review and meta-analysis approach. Surv Ophthalmol 2000;44:367-408. Condon PI, O'Keefe M, Binder PS. Long-term results of laser in situ keratomileusis for high myopia: Risk for ectasia. J Cataract Refract Surg 2007;33:583-90. Brittingham S, Tappeiner C, Frueh BE. Corneal cross-linking in keratoconus using the standard and rapid treatment protocol: Differences in demarcation line and 12-month outcomes. Invest Ophthalmol Vis Sci 2014;55:8371-6. Huang SC, Chen HC. Overview of laser refractive surgery. Chang Gung Med J 2008;31:237-52. Alharbi A, Swarbrick HA. The effects of overnight orthokeratology lens wear on corneal thickness. Invest Ophthalmol Vis Sci 2003;44:2518-23. Binder PS. Ectasia after laser in situ keratomileusis. J Cataract Refract Surg 2003;29:2419-29. Ho T, Cheng AC, Rao SK, Lau S, Leung CK, Lam DS, et al. Central corneal thickness measurements using Orbscan II, Visante, ultrasound, and pentacam pachymetry after laser in situ keratomileusis for myopia. J Cataract Refract Surg 2007;33:1177-82. Solomon OD. Corneal indentation during ultrasonic pachometry. Cornea 1999;18:214-5. Marsich MW, Bullimore MA. The repeatability of corneal thickness measures. Cornea 2000;19:792-5. Ou TH, Lai IC, Teng MC. Comparison of central corneal thickness measurements by ultrasonic pachymetry, Orbscan II, and SP3000P in eyes with glaucoma or glaucoma suspect. Chang Gung Med J 2012;35:255-62. Yekta AA, Hashemi H, Khabazkhoob M, Dostdar A, Mehravaran S, Heravian J, et al. Comparison of central corneal thickness measurements with Pentacam, Orbscan II, and ultrasound pachymeter. Iran J Ophthalmol 2009;21:51-7. Bayhan HA, Aslan Bayhan S, Can I. Comparison of central corneal thickness measurements with three new optical devices and a standard ultrasonic pachymeter. Int J Ophthalmol 2014;7:302-8. Bao F, Wang Q, Cheng S, Savini G, Lu W, Feng Y, et al. Comparison and evaluation of central corneal thickness using 2 new noncontact specular microscopes and conventional pachymetry devices. Cornea 2014;33:576-81. Khaja WA, Grover S, Kelmenson AT, Ferguson LR, Sambhav K, Chalam KV, et al. Comparison of central corneal thickness: Ultrasound pachymetry versus slit-lamp optical coherence tomography, specular microscopy, and Orbscan. Clin Ophthalmol 2015;9:1065-70. Ramesh PV, Jha KN, Srikanth K. Comparison of central corneal thickness using anterior segment optical coherence tomography versus ultrasound pachymetry. J Clin Diagn Res 2017;11:NC08-11. Leung DY, Lam DK, Yeung BY, Lam DS. Comparison between central corneal thickness measurements by ultrasound pachymetry and optical coherence tomography. Clin Exp Ophthalmol 2006;34:751-4. Scotto R, Bagnis A, Papadia M, Cutolo CA, Risso D, Traverso CE, et al. Comparison of central corneal thickness measurements using ultrasonic pachymetry, anterior segment OCT and noncontact specular microscopy. J Glaucoma 2017;26:860-5. Li H, Leung CK, Wong L, Cheung CY, Pang CP, Weinreb RN, et al. Comparative study of central corneal thickness measurement with slit-lamp optical coherence tomography and visante optical coherence tomography. Ophthalmology 2008;115:796-801.e2. Gorgun E, Yenerel NM, Dinc UA, Oncel B, Kucumen RB, Oral D, et al. Comparison of non-contact methods for the measurement of central corneal thickness. Ophthalmic Surg Lasers Imaging 2011;42:400-7. Chang SW, Tsai IL, Hu FR, Lin LL, Shih YF. The cornea in young myopic adults. Br J Ophthalmol 2001;85:916-20. Ahmadi Hosseini SM, Mohidin N, Abolbashari F, Mohd-Ali B, Santhirathelagan CT. Corneal thickness and volume in subclinical and clinical keratoconus. Int Ophthalmol 2013;33:139-45.
de Sanctis U, Aragno V, Dalmasso P, Brusasco L, Grignolo F. Diagnosis of subclinical keratoconus using posterior elevation measured with 2 different methods. Cornea 2013;32:911-5.